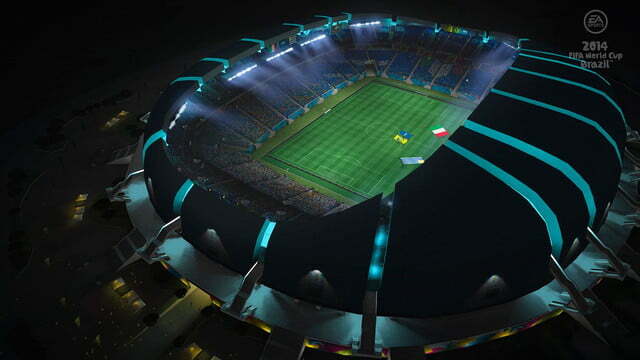 Inside 2014 FIFA World Cup is a winning exuberance for both the World Cup season and an admirable economy of features. Same sterling field play as FIFA 14 on PS3/Xbox 360. Lack of clutter from modes like Ultimate Team. 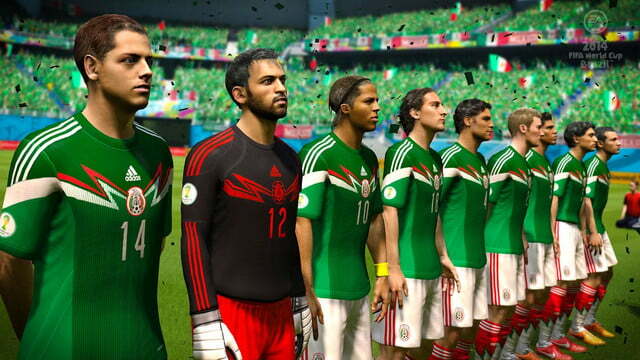 Lack of feature parity with FIFA 14 makes $60 price tag exorbitant. Lack of modes like Ultimate Team may turn off fans. 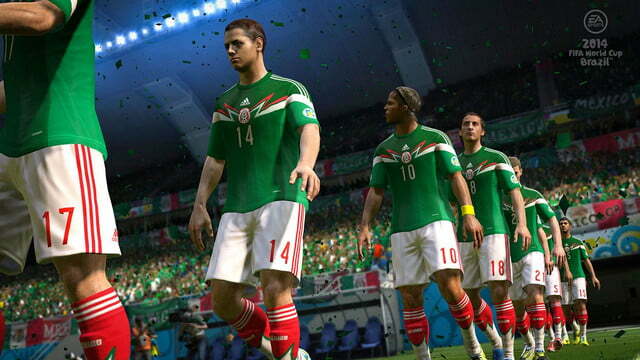 Field game can't stack up to FIFA 14 on PS4/XB1. “Enthusiasm is everything,” says Brazilian soccer legend Pele in Victory, the truly ridiculous movie wherein multinational World War II POWs must play an exhibition soccer match against Nazis in order to escape. “It must be taut and vibrating like a guitar string.” Pele’s explaining to Sylvester Stallone and the other prisoners why exuberance, one of the defining characteristics of both broader Brazilian culture and football’s role within it, is so essential to playing the game. 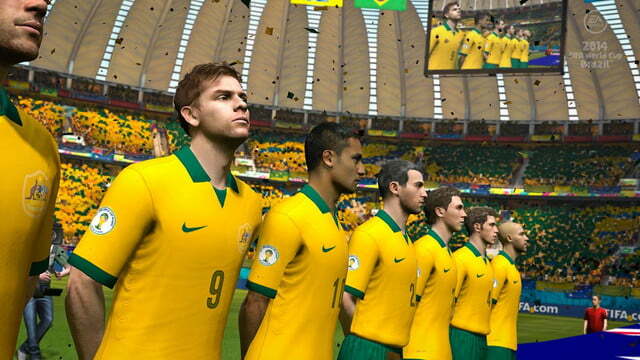 It should be stated up front that nothing nearly this awesome ever happens in EA Sports’ 2014 FIFA World Cup Brazil. No sweet matches where you crush Nazis on the pitch are played. Pele delivers no rad speeches to Sylvester Stallone. His advice, though, is practiced all throughout. It may seem like a quick and dirty licensing opportunity, arriving just seven months after FIFA 14 as a full-priced $60 game for PlayStation 3 and Xbox 360. 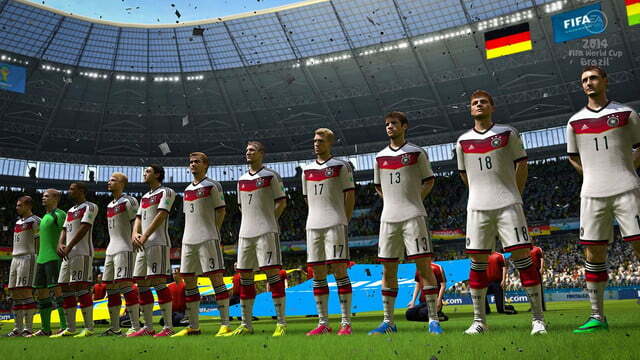 Inside the guts of this game is a winning exuberance for the World Cup season and an admirable economy of features. This is purely a World Cup experience. 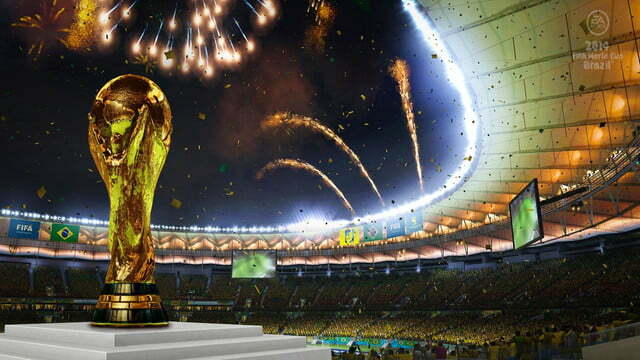 2014 FIFA World Cup Brazil is a rare case of less actually being more. For any football fans that skipped the spectacular FIFA 14 in favor of waiting for World Cup or players that did pick it up and want even more, be forewarned: this is a far more sparse package than EA Sports’ perennial soccer tent pole. Gone are the many modes, individual teams from MLG or the Premiere League, and their individual replica stadiums. New York Red Bulls fans thinking they can pop this in and find Thierry Henry’s card for their Ultimate Team pack should go pick up FIFA 14 instead. This is purely a World Cup experience. In that regard, it is impressively thorough, with all 203 national teams that competed for World Cup qualification and replicas of the 12 stadiums hosting World Cup matches this summer, from Rio de Janeiro’s Maracanã Stadium to Fortaleza’s Costelao. The tournament also acts as the nucleus for World Cup‘s variations on FIFA‘s core modes as well. Road to the FIFA World Cup lets you select a national team of your choosing, and take them all the through qualifying rounds, training sessions for individual players, and finally onto the tournament itself. Road to Rio de Janeiro is an online-only campaign that lets you play across the dozen Brazil venues against real world players to win the cup for yourself. 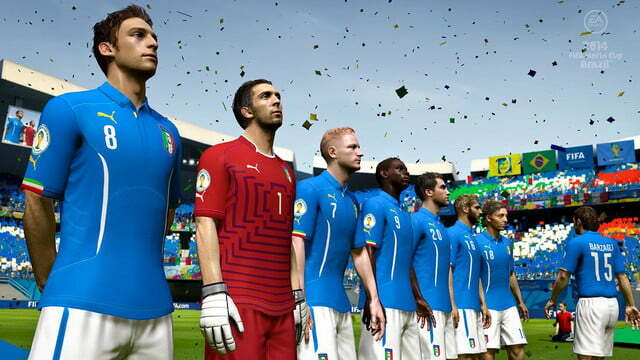 They lack the sheer range offered by FIFA 14, but the campaigns themselves aren’t diminished by losing the granular simulation of global football at every level. If there’s any drawback, it’s that the game is more forbidding to new players. 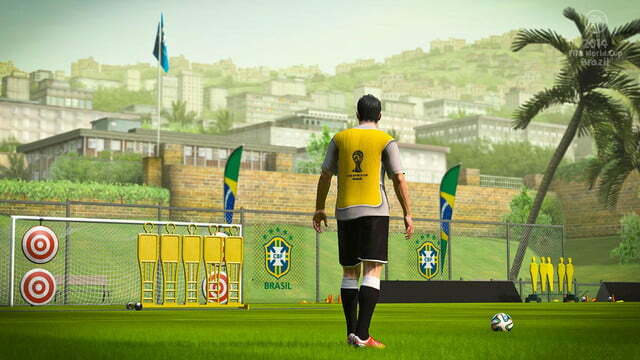 FIFA‘s always excellent skill games used for training are on hand, and the game does invite you to play them at the beginning of your first matches to help set the AI difficulty or control scheme. Sadly, it never does anything so elegant as dropping you directly into a match amongst stars like Lionel Messi as FIFA 14 does when you first turn it on. 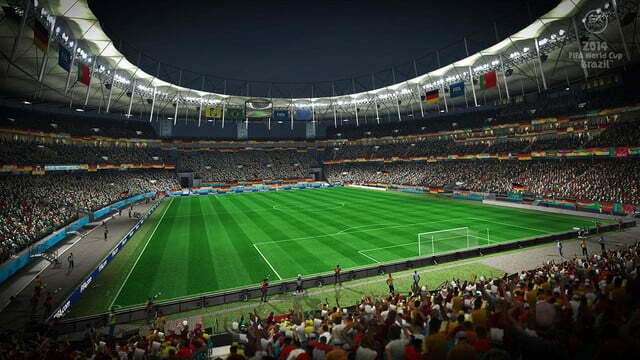 The assumption seems to be that World Cup is for football diehards, but this is a game that ties into the most popular soccer event in the world, and only on consoles with the biggest install base. The experience could have benefited from a friendlier structure for absolute beginners. World Cup makes up for those faults in a myriad of subtle ways. Captain Your Country, the stand-in for FIFA’s create-a-character career, isn’t dramatically different from that of the main game, but the World Cup-specific color commentary goes a long way to making it feel unique and, yes, exuberant. Listening to Andy Goldstein and Ian Darke ruminate on how insane it would be for Italy to name a new team captain right as it enters the World Cup qualifying rounds is the kind of quiet touch that elevates EA’s game above the cash grab it might seem to be. If you have FIFA 14 and want to get some World Cup action in your game, maybe wait for the price to drop. That quiet enthusiasm holds true for the package as a whole. 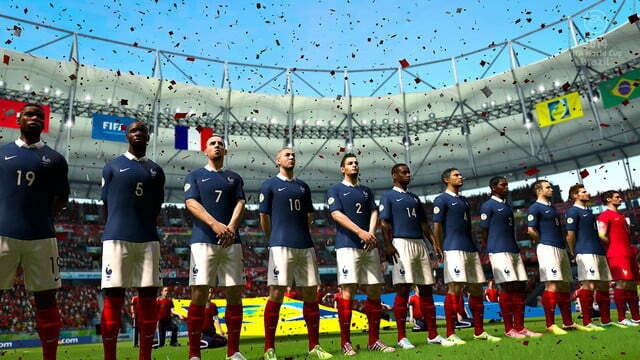 From the green and yellow wash of the menus to the lack of blaring licensed pop songs cluttering up the game, World Cup benefits from the absence of things like Ultimate Team. While it may not invite players into the fundamentals of play as well, it does have far fewer barriers to the action than proper FIFA games. Somewhere between the sparser, laser focus of World Cup and the absurd range of options available in the centerpiece games released every year by EA Sports is the ideal soccer game that highlights the series’ spectacular field play. 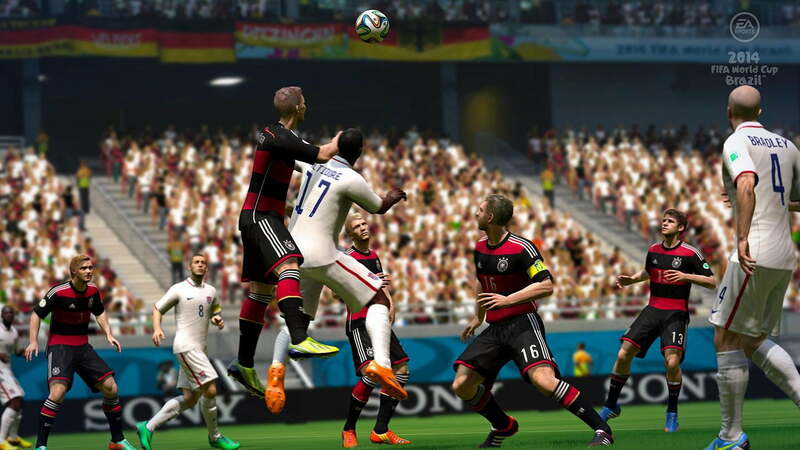 Speaking of the field play, the action feels identical to that of FIFA 14 (read our review). World Cup comes with a marketing-ready blitz of bullet-pointed improvements to the field game–“New Penalty Kicks” and “Adidas Ball Physics” and “Set Piece Tactics” oh my!–but in practice, this game feels indistinguishable from last fall’s game. That’s no bad thing. The teammate AI, the tactility of moving down the field, the inertia of the ball, all of it feels just as good in World Cup. EA’s series remains peerless in giving you a game that feels physical and gives you dual the sensations of controlling both a team and an individual on the pitch. It should be noted, though, that it does not have the slightly improved feel offered in the Ignite engine-powered PlayStation 4 and Xbox One versions of FIFA 14. Those are the gold standard that this Xbox 360/PS3-only version of the game can’t quite match. It doesn’t need to though. 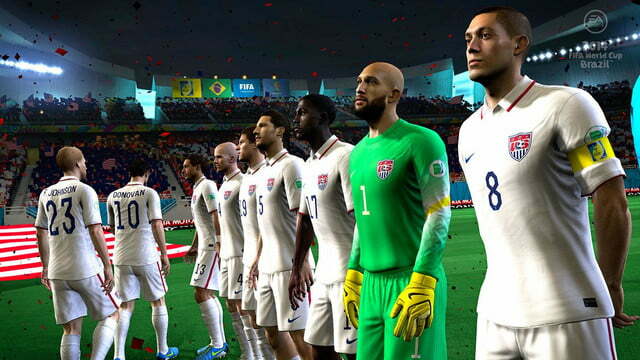 2014 FIFA World Cup is a great soccer video game. Absentee modes like Ultimate Team and irritating pop soundtracks may make this a non-essential purchase for series devotees (and may make the $60 price tag seem all the more outrageous), but there’s an admirable clarity in World Cup. 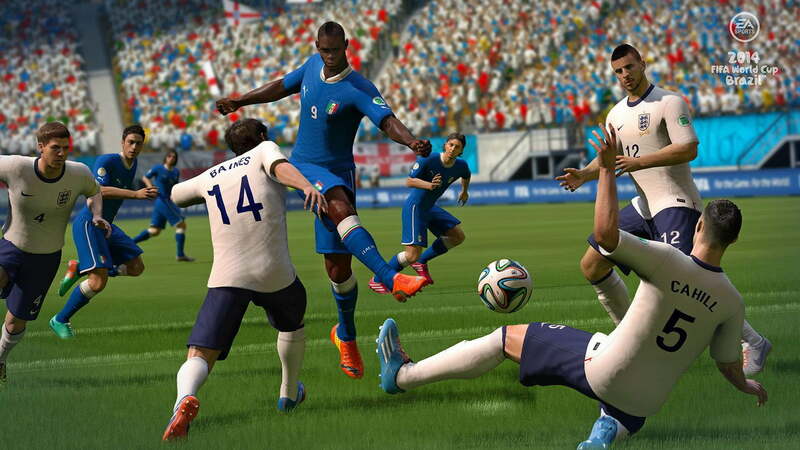 If you have FIFA 14 and want to get some World Cup action in your game, maybe wait for the price to drop. If you just want a killer soccer video game, though, this option is taut and vibrating like a guitar string. This game was reviewed on an Xbox 360 using a disc provided by EA Sports. 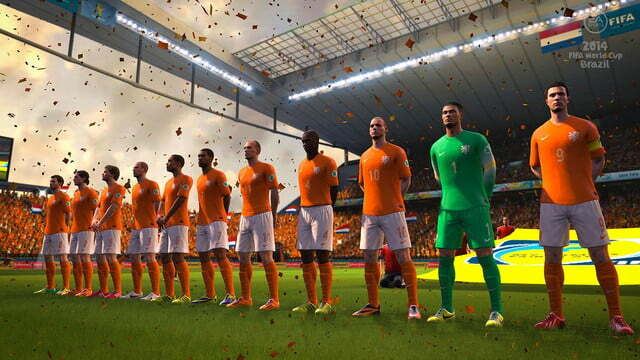 Field game can’t stack up to FIFA 14 on PS4/XB1.